Nestled between the glitz and glamour of Hollywood and the stately manors of Beverly Hills, West Hollywood has long had the reputation of being a wide open town with few rules and fewer still inhibitions. For many years an unincorporated town in the heart of L.A. county, it thrived on the less restrictive edicts of the county and by the 1920's, nightclubs, bars and casinos abounded on the infamous Sunset Strip. Although it's residential population is just shy of 40,000, its weekend and night time population swells to nearly three times this number. Yes, West Hollywood, or WeHo as the residents call it, is a party town! In the mid-1960s, West Hollywood and the Sunset Strip were ground zero for the musical teen youth culture, with scores of great clubs, music shops, recording studios, boutiques, hipster hangouts, radio stations, and record stores. The hippie movement had injected new life and diversity into the town and young people flocked to the West Hollywood clubs like the Troubadour, Rainbow, and the Whisky A Go Go. 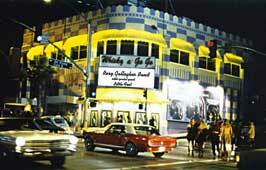 The Whisky A Go Go first opened its doors on January 11, 1964 at the site of an old bank building that had been recently remodeled into a nightclub called the Party. The Whisky, as it is affectionately known, is said to be the first real American discotheque and gave birth to the concept of Go Go dancers in cages. 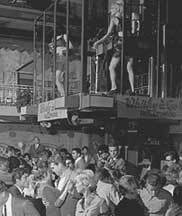 As the story goes, a mini-skirted DJ who had been spinning records in between sets from a suspended cage near the stage, started dancing to the live music. The audience bought into the act and the rest is history. Elmer Valentine, the owner of the new club and a former Chicago policemen, made the Whisky A Go Go an immediate success with the signing of rising star, Johnny Rivers, to a lucrative residency. Located on the strip between the streets Clark and Hilldale, the Whisky played an important role for Southern California based bands like The Byrds, Buffalo Springfield, The Doors, The Mothers of Invention, and Love with Arthur Lee. It was here in 1966 that the Doors had their very first residency, taking there name from a book by Aldous Huxley titled "Doors to Persception". (The book, signed by all four members of the Doors remains prominently displayed at the club.) The Whisky would often have 2 or 3 acts a night, marquee names as well as the popular local bands. Van Morrison and Them did 2 weeks of shows with the Doors as their opening act. On their last night, "Them and The Doors play together for the last set, including a 25 minute In The Midnight Hour and a 20-minute Gloria." The club was later immortalized in Arthur Lee's song, "Maybe the People Would be the Times or Between Clark and Hilldale" off the critically acclaimed album, "Forever Changes". Many British bands made their first headlining performances in the area at the Whisky, including The Kinks, The Who, Cream, Led Zeppelin and The Rory Gallagher Band. Rory's first tour of the States following the breakup of Taste started at the Whisky A Go Go. He played the the Whisky for 5 successive nights, October 13-17, 1971. 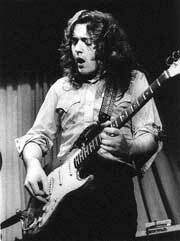 To read the Michael Ross review of Rory's first gig at the Whisky taken from the October 16, 1971 edition of the Los Angeles Times click HERE. To request a particular bootleg, or wish notification when a new bootleg is put on site go HERE. Administrator comment: email me at milo@shadowplays.com or use the form in the EXTRAS/CONTACT section of the site for information regarding passwords. Thanks for your efforts and the always fine background story of the boot and venue. Yea, I do [remember opening for Rory at the Whisky]...fun night. I didn't think anybody else remembered that night, though. Administrator comment: Steve was the keyboardist for Mose Jones, a great band out of Atlanta who opened for Rory at the Whisky one night. Thak you Milo, you're the one! Great website..Again how do I obtain the password to down load the mP3 please? I thought the sound quality was ok--somewhat compressed but ok. The music is terrific. I really enjoyed hearing songs which were dropped on later gigs. what is the password for downloading the mp3 copy? and can i still access all the old mp3's? and did Rory ever do a live version of 20:20 vision? Administrator comment: Hello Sean, I don't have the bandwidth to keep all boots available at all times. However, I am thinking about having the jukebox loaded for each boot done. I do have a version of 20:20 vision from the Radstadion in Frankfurt, Germany on July 22, 1973. Feel free to email me at milo@shadowplays.com if you have any more questions. The sound quality really affects this otherwise great gig.